Kick off your visit on the 21st (Mon): snap pictures at Ponte di Rialto, contemplate the long history of Ponte dei Sospiri, then explore the galleries of Doges' Palace, then contemplate the waterfront views at Canal Grande, and finally take a stroll around Isola di Burano. On the 22nd (Tue), you'll have a packed day of sightseeing: take in the spiritual surroundings of Basilica di Sant’Antonio - Basilica del Santo, then get to know the fascinating history of St. Mark's Square, then make a trip to Basilica di San Marco, and finally contemplate the long history of St Mark's Campanile. To see ratings, where to stay, reviews, and tourist information, use the Venice itinerary builder. Turin to Venice is an approximately 4-hour car ride. You can also take a train; or fly. In August, daily temperatures in Venice can reach 33°C, while at night they dip to 22°C. Finish up your sightseeing early on the 23rd (Wed) so you can travel to Rome. Start off your visit on the 23rd (Wed): explore the ancient world of Colosseum, then hunt for treasures at Porta Portese, then examine the collection at St. Peter's Basilica, and finally wander the streets of Via Condotti. Keep things going the next day: stop by Elena Kihlman Designer, then explore the galleries of Vatican Museums, then look for gifts at Paciotti Salumeria, and finally make a trip to Pantheon. For traveler tips, where to stay, photos, and other tourist information, refer to the Rome vacation planner. You can fly from Venice to Rome in 3.5 hours. Alternatively, you can take a train; or drive. When traveling from Venice in August, plan for somewhat warmer days and about the same nights in Rome: temperatures range from 38°C by day to 22°C at night. Cap off your sightseeing on the 25th (Fri) early enough to catch the train to Florence. On the 25th (Fri), make a trip to Mercato Centrale, then see the interesting displays at Uffizi Gallery, then stop by Davide Cerasi Leather Boutique, and finally snap pictures at Ponte Vecchio. Keep things going the next day: look for gifts at Goccia Shoes, take some stellar pictures from Piazzale Michelangelo, stop by L'Arte dei Ciompi, see the interesting displays at Galleria dell'Accademia, then take in the spiritual surroundings of Cathedral of Santa Maria del Fiore, and finally look for gifts at Pegna dal 1860. For other places to visit, ratings, more things to do, and other tourist information, you can read our Florence vacation builder. You can take a train from Rome to Florence in 2 hours. Other options are to drive; or fly. In August in Florence, expect temperatures between 38°C during the day and 21°C at night. Finish your sightseeing early on the 27th (Sun) to allow enough time to take a train to Pisa. Kick off your visit on the 27th (Sun): explore the different monuments and memorials at Camposanto, make a trip to Piazza dei Miracoli, then admire the landmark architecture of Duomo Pisa, then steep yourself in history at Battistero, and finally enjoy breathtaking views from Torre di Pisa. 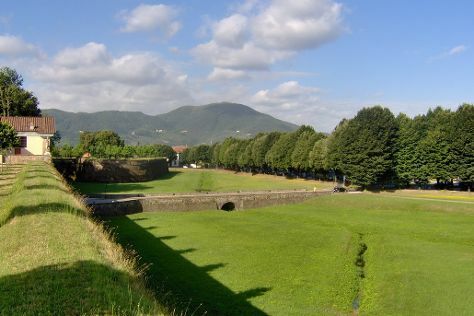 Keep things going the next day: browse the eclectic array of goods at Mercato Centrale, don't miss a visit to Piazza Anfiteatro, steep yourself in history at Le mura di Lucca, then enjoy breathtaking views from Guinigi Tower, and finally admire the striking features of St Martin Cathedral. For where to stay, other places to visit, more things to do, and tourist information, refer to the Pisa trip generator. You can take a train from Florence to Pisa in an hour. Alternatively, you can take a bus; or drive. Expect a daytime high around 35°C in August, and nighttime lows around 21°C. Finish your sightseeing early on the 28th (Mon) so you can drive to Turin. Shop till you drop at Serravalle Designer Outlet and Vicolungo The Style Outlets. Venture out of the city with trips to Cumiana (Zoom Torino & Team Adventure), Villa Taranto (in Verbania), Sacra di San Michele (in Sant'Ambrogio di Torino) and La Venaria Reale (in Venaria Reale). And it doesn't end there: admire the masterpieces at Egyptian Museum of Turin, don't miss a visit to Piazza San Carlo, contemplate in the serene atmosphere at Basilica di Superga, and admire all the interesting features of Juventus Stadium. For where to stay, other places to visit, traveler tips, and other tourist information, use the Turin trip itinerary builder. You can drive from Pisa to Turin in 3.5 hours. Other options are to take a train; or fly. Traveling from Pisa in August, expect nights in Turin to be about the same, around 22°C, while days are slightly colder, around 31°C. Cap off your sightseeing on the 4th (Mon) early enough to travel back home.